Subway giving away free subs with purchase on National Sandwich Day!!!! More than 42 million Americans—including more than 13 million children—live in households that may not have enough food for an active, healthy life. That’s why this year on National Sandwich Day, SUBWAY restaurants is inviting the nation to join The Good Deed Feed. 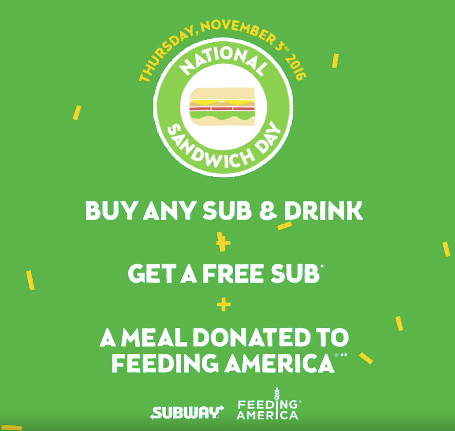 Guests who buy any sub and any drink on Thursday get a free sub of equal or lesser value, and SUBWAY will donate one meal to Feeding America. SUBWAY restaurants are striving to make National Sandwich Day the single largest meal donation day in Feeding America’s history by donating more than 11 million meals—with no limit on the number of meals donated. Following National Sandwich Day, SUBWAY® restaurants will reveal the final donation. In Subway restaurants, customers will be able to access a custom National Sandwich Day Snapchat filter as part of the promotion.